Garry Monk can come back a better manager following his departure from Swansea City, according to Stoke City boss Mark Hughes. Swansea parted company with Monk, who said he could have turned the team's fortunes around, after winning just once in 11 Premier League games. Former Wales boss Hughes said: "Maybe he'll come back with a broader outlook. "It's a setback for him, but sometimes you need these setbacks to really shape you as a manager." 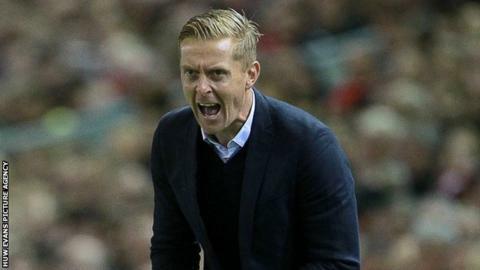 Monk, 36, had been with Swansea for more than 11 years, first as a defender and then manager since February 2014, when he replaced Michael Laudrup. But with the Swans only one point above the relegation zone following a 3-0 defeat by Leicester City, Monk was sacked on Wednesday. Hughes is the third-longest-serving manager at a Premier League club, having been in charge at Stoke for two-and-a-half years, behind Arsenal's Arsene Wenger (19 years) and Eddie Howe of AFC Bournemouth (three years). He says Monk's dismissal is an indication of how "volatile' football management is at the top level. "It's always upsetting when a manager loses their role at a club and Garry obviously had a long history at his club," Hughes added. "It wouldn't have been a decision anybody at Swansea, given his long period of service at the club, took lightly. "It's sad for Garry, but having met him and come up against him, I'm sure he'll come back very strong." In a statement released via the League Managers Association, Monk spoke about his "great sadness" about leaving the club he joined under Kenny Jackett in June, 2004.